If you've done the Manhattan Beach 10k in the last 20 years or sign up this year, you'll likely bump into one of these two! If you have not had the pleasure to meet their acquaintance yet, let us introduce you to Rachel Judson and Annmarie Hext. Rachel is our esteemed Race Director with her adorable sidekick Tate the Adventure Poodle. Annmarie is our brilliant Registration Director. While these are their main VOLUNTEER jobs for the race, they do so much more behind the scenes to make the race happen without a hiccup year after year. How long have you been the MB10k Race Director? Since the 25th running in 2002. How did you first get involved with the MB10k? Two great men are responsible: John Post & Don Sirvio. In the late 90s, having known each other for years, John was recruiting for the Committee, and called my business partner Don to see if he was interested in joining the Committee. Don wasn't and recommended me. As a runner I had wanted an opportunity to give back to the sport I love; it was a match made in heaven. The rest is history. What’s it like to be Race Director and work with the 31 others on the Race Committee? What is your biggest challenge putting on a race of this size? Post-2010, it is marketing. (Google WSJ - How the Millennials Ended the Running Boom 2016 for more info). There are so many ways the public gets information, so many opportunities for things to do and the challenge is making sure people know we’re a fantastic event, one that they should do annually, and that they sign up. Why do you love the MB10k? It brings out what I think is the best Manhattan Beach has to offer. I got involved to give back to running and in return I got the people. If anyone has any doubt of the true love there is for this community, I assure them it is here and shines with the people who volunteer and do the race. It is also so nice that people outside our area get to share in an experience that shows that Manhattan Beach isn’t just pretty, it’s a true community. It’s also a pure volunteer event tied to a city I love with profits being donated back to Manhattan Beach. Why should someone race the MB10k? It appeals to serious competitive runners (USATF certified course), and fun for less competitive, including walkers, who want a well organized 10k with lots of entertainment and post-race Expo that is fantastic (not to mention the bonus ‘unofficial finish line’ of Shellback). If that isn’t enough, being able to show off a gorgeous finisher’s t-shirt that’s like a work of art, and knowing the profits go back to the community. Can you let us in on any fun secrets for this October 5th? Expo changes: another photo booth with fun props and re-vamp to the North Lot being wellness-focused. All the more reason to stay and enjoy Manhattan Beach after the race! What do you hope for the future of the race? I’d love those at the 100th running to look back and say, “Wow, that’s really cool that this has been a great tradition for so long!” For generations to come, I hope the race continues with the sense of community it was founded upon, and that it outlives us all. Long may it run. How long have you been the Registration Director for the race? This is my 17th year on the committee. I can’t believe it’s been that long! Back then, I was new to running and loving it! I was meeting new people and forming new friendships in the running community. One of those friends, Alison Guerrero, had recently joined the Race Committee and always had such great things to say about the group. Alison invited me to volunteer my first year and I loved it! When the Race Committee began recruiting new members as part of their succession plan, I offered to fill the position of Registration Director, previously held by Rachel. Those were big shoes to fill! Your adult kids are now involved in the race, how fun is that for you? Oh my goodness, it’s too fun! Over the years, they have put in a lot of time at our dining room table in support of my race duties. It’s no exaggeration to say that they’ve processed thousands of race bibs! When they expressed interest in joining the Race Committee, I was so excited! Tyler sits on the Registration subcommittee with me, and Bex will transition to Expo chair this year. I am so proud of the people my kids have become and working with them on the MB10k is special to me (this calls for a heart emoji!). Signing up for the MB10k is very seamless, how do you make it so easy for people? Wow, thanks for the compliment! I work hard to make the process run smoothly, but I can’t take all the credit. Our partnership with Village Runner is huge. They really are the face of this race prior to race day and we couldn’t ask for a better team. I work closely with them to address the wants and needs of our runners while staying true to our commitment to keeping it ‘hometown’. Can you share with us some fun stories about people who have participated in the race? I love our runners! They’re real and they’re kind and they have brought me so much joy over the years. My favorite would have to be the email I received with the subject line that read “The dog ate my number”. A dog mom myself, I just laughed out loud at the thought of 5½-month-old Maddie going full attack mode on that race bib. Of course, I requested a photo! I have to say, she looked innocent to me. We are now having racers from other countries sign up for the MB10k, why do you think that is? Can you believe it?! It used to be the occasional international runner, but it’s really growing these past few years. Many of them are past residents returning home for the race, but now that we have a social media presence, newbies are finding us and planning trips around the race. But don’t you worry, domestic runners. No matter how far people travel for this great event, we are committed to keeping it ‘hometown’. That’s why people love this race and that won’t change. WE'LL SEE YOU AT THE STARTING LINE ON OCTOBER 5, 2019! The proceeds for the last 40 years of the Manhattan Beach 10k, which total more than $560,000, have been directly donated back to the Manhattan Beach community! We are so very grateful to all of you who have run or walked the race and helped make this a reality. In June of this year, we were pleased to award five, $1000 scholarships to graduating seniors from Mira Costa High School during their Senior Recognition Night! *PLEASE NOTE! REGISTRATION IS NOW OPEN AT VILLAGE RUNNER, MANHATTAN BEACH AND WILL CONTINUE THROUGH OCTOBER 5, 2018, BEFORE 7 P.M. ONLINE REGISTRATION CLOSES OCTOBER 1, 2018 AT 11:59 P.M.
Barry, along with his wife Kathy, own GROW in Manhattan Beach and Downtown Los Angeles. They specialize in farm-fresh produce, artisan cheeses, prepared meals, meat, fish & other gourmet groceries at their mom-&-pop markets. They have been a sponsor of the Manhattan Beach 10k since they opened their doors in 2006. Each year our racers make a beeline to the expo to grab handfuls of their refreshing grapes! Your produce shop GROW in Manhattan Beach opened in 2006, please tell us how you got your start. It began with the need for a boogie board. Our son sold fruit in front of our home to raise money for a boogie board. We sourced fruit from growers whose fruit I export to Asia. Our neighbors appreciated the quality and began leaving notes in our mail box with cherry orders for my son. This is how we got the idea to open GROW. Being from the Central Valley, how did you choose to settle in Manhattan Beach? A good friend recommended Manhattan Beach when I was moving to a new company based at LAX. The weather was picture perfect the day we arrived to look at homes. We fell in love with Manhattan Beach and did not look at any other communities. To this day we know we made the right choice. You recently opened a second location in Downtown L.A., how does this location differ from your Manhattan Beach spot? The biggest difference is each shop’s customer base. South Bay customers are typically families while DTLA is generally single people. We took the Manhattan Beach model to DTLA and quickly learned we needed to make some dramatic changes for GROW to meet the needs of our new customers. The prepared department, grocery and alcohol departments are the sales base for DTLA while produce, grocery and meat/fish are in MB. What do your markets specialize in? 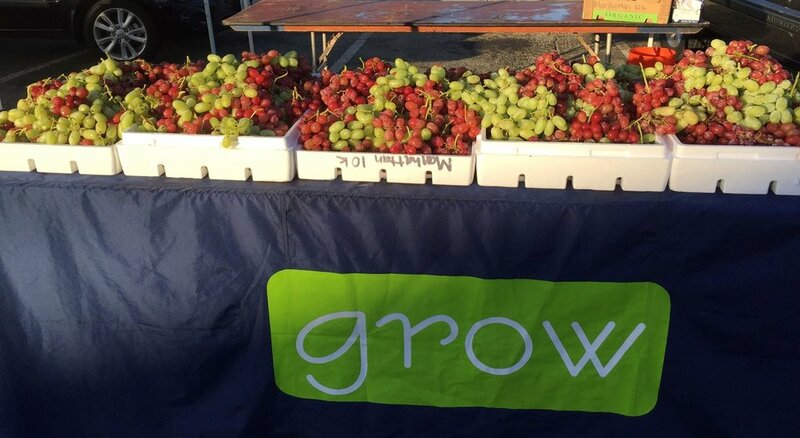 GROW specializes in fresh produce, prepared meals, meat, fish, select groceries and artisan cheeses. Why should people shop at GROW vs other markets? "You have the best produce and my kids eat more of it because it tastes so good." "I trust the items in your store as I feel you take the time and care to insure they are good to eat and my family will enjoy them." "I have a hard time eating a filet at any restaurant since I can prepare yours better at home." "GROW is a local business who supports our community more than any other grocery store in Manhattan Beach." "I love that I can park my car right by the door, be in and out in less than 5 minutes with a great meal. I love the convenience." "Your morning delivery is perfect. I can order by midnight and everything is on my doorstep by 7:00 am the next morning. And you pick better produce than I can!" "I am a member of these cults: GROW salsa, GROW guacamole, GROW chicken noodle soup, GROW pork chops, GROW cherries." You sponsor many South Bay schools and charities. What inspires you to give back to the community in this way? We live here. This is our community and we care about our schools. Our children were taught from Grand View to MBMS then Costa. We feel the schools in our community are the foundation of Manhattan Beach and deserve our support. Now that we are in the midst of summer, what’s your favorite produce for this season? It changes every week! Most people will see “plum” or “yellow peach” at a typical grocery store. What many people who do not shop GROW don’t realize is there are so many varieties of pluots, peaches, nectarines, plums and grapes. We educate our customers about the differences. On stone fruit, they change about every 10 days or so. Understanding this, my taste jumps around each week. Today, I like the Red Phoenix pluot. In about 10 days, we are going to have my favorite plum of the year- the Emerald Beaut. What is great, customers have been asking for the Emeralds for over a month - they know what good fruit is. How long have you been a sponsor of the Manhattan Beach 10k? We opened Sept 19, 2006. We were at the MB 10k two weeks later cutting oranges. I remember that day perfectly as I was cutting oranges until my left hand was numb. Runners are excited to see us at the finish line year after year! How did you first get involved with the race? Our friends at Village Runner recommended we participate. So glad they reached out to us. This is the longest partnership we have had with a community event. What can participants expect to see at your booth this year? What do you most love about the race? Seeing our friends, neighbors and GROW customers after the race. Love to hear shout outs from runners saying nice things about the shop and our great staff. But what we really love is that we feel we are part of the community. Barry and Kathy have generously offered a double discount to our race participants! After you pick up your race bib from Village Runner, MB in October, take a few steps to your left and visit GROW for your food shopping. They will give you 10% off before the race and 10% off after the race when you show them your bib. Early Registration is going on now through September 24, 2018. Online registration is open NOW at www.mb10k.com and ends October 1, 2018 at 11:59 p.m.
In-store registration opens September 1 at Village Runner, Manhattan Beach and ends October 5, 2018. Sponsor Spotlight | Cynthia Snyder State Farm Insurance Agency Inc.
Cynthia is a longtime resident of the South Bay and has her own business in Manhattan Beach. She is one of our awesome Manhattan Beach 10k sponsors. You can stop by her booth after the race to say hello and grab some goodies! You have a State Farm Insurance Agency in Manhattan Beach, please tell us about your business. I started my business in January of 2004, my husband and I were newly married. Since that time we’ve had two children and my office team has grown to 4 employees. I feel like I have two families to nurture! I guess I should look at my race t-shirts as to when I started! I enjoy seeing the same faces every year, some new ones, and catching up with everyone. The energy is always so positive. I like having athletic goals on the calendar to keep me moving forward. Supporting the local community through a 10k made it an easy decision to sign up. Rumor has it that your kids have helped at your expo booth so you can participate in the run! Is that true? Yes, both of my kids and their friends really enjoy ‘helping’ me out at my booth (in spite of getting out of bed earlier than they’d like). Although, they spend most of their time chatting up the other vendors and business owners…..I want to run this year so they will have to stay put just during my race. Hmmm, I should take a poll of what goodies people want at the end of their race! I usually have branded items such as bags so the runners have something to carry all the goodies. I’ve given out sunglasses, sunblock, lip balm, water. I’m always thinking of what I would like and would stand out so people may think of my office when they need an insurance quotation or have insurance questions. If you have any good ideas, please let me know asap so I can starting buying! I truly love bumping into friends, clients, and so many people I know in the community. It feels good to support a place that we all love….the good energy really fills my cup. As far as the actual race, my absolute favorite part of the race is coming down the final stretch on the Strand and hearing all of the homeowners cheering for the runners. That’s what keeps me coming back! What made you get into running? Since I’m a very slow runner, I’ve never really considered myself a ‘runner’. I got into running for exercise, and ultimately enjoyed losing myself in my music and the way I felt afterwards. It’s kind of a meditation for me. I have a desk job so I know I just have to keep moving any way I can. A nice balance of yoga, circuit training, walking, and running seems to keep me going and feeling good. Cynthia and her team offer a wide range of insurance services, please feel reach to reach out to her with any questions you have! The South Bay is fortunate to have many run clubs. One of our personal favorites is Club Ed! This group always has a huge presence at the #mb10k each year and we appreciate their support and participation. We had the good fortune to interview the head honcho himself, Ed Avol and a prominent member of the club and elite runner in her own right, Nathalie Higley. Club Ed is a running club whose goal is to help runners of all ages and fitness enjoy the sport of running at all levels of speed, experience, and talent. It provides organized venues for members to train and experienced guidance to help runners of all levels improve. With a low-key approach to personal improvement fueled by each runner’s individual motivation, the club provides a way for new runners to meet other local runners, discover new places to run, and to learn and practice better ways to train. It also encourages support of the local running community by helping out at local races and encouraging members to challenge themselves through periodic racing. For more iInformation about Club Ed click here. When and how did you start club Ed? I previously had coached the Manhattan Beach Track Club (MBTC) in the latter half of the 1980s, then moved away for a job opportunity. When I returned to the area in 1992, several former runners from MBTC approached me and asked if I would coach them again…so I did. What is your running philosophy? I approach running as a lifetime activity – at most any age, you can train and run and race, at a level of competition and achievement that you define for yourself. Running is social at times, and hard work at other times. Training–wise, I believe in a strong foundation of distance upon which interval training, recovery days, and a structured plan (instead of random running) combine to lead to personal improvement…but it comes from the individual – I cannot “force” you to run. What is your favorite #mb10k moment? Historically, a highlight for me was something we don’t do anymore -- running out and back on the pier (in the old days of the race) in the last rush to the finish. Nowadays, an annual highlight is getting to that seemingly never-ending last mile along the Strand, where the Finish Line doesn’t seem to ever be getting much closer…but you somehow get there! What are your best tips to train for a 10k? Give yourself time to build a base – trying to do this in a few weeks is a prescription for injury and frustration. For most any distance and any running, getting a training partner – someone with whom to share the highs and lows, someone to keep you “honest” in your effort and consistency, even someone to “guilt” you into showing up on those days you are dragging and don’t want to run – is the best thing you can do for your training. What's your best race tip for a first time/novice runner for a 10k? Have a plan … and work towards it. Preparation, consistency, confidence, and commitment dramatically improve the chances for success. Why do you run with Club Ed? I always feel it is better to run with a group. The club is an opportunity to get together and train with people who are very friendly and have access to a very knowledgeable coach. There’s a need to be social, to be challenged and to be better and the club meet those needs. It also feels like a family and a social gathering, you see these people on a regular basis and you share a passion for running with them. How many #mb10k races have you run? I think about 17 or 18. How many of these have you won? What do you love about the #mb10k? It is always nice to get to the finish and see the beautiful pier. It is a great course and a challenging course. I enjoy seeing all the people cheering you on and listening to the music and all the support along the way. It is fun and entertaining and always fun to head off to the Hometown Fair Beer Garden afterwards! Save money & register before midnight tonight! (we’re talking 11:59 p.m. people) Fees increase September 20th! The #MB10K is going to be at the Manhattan Beach Farmers Market on Tuesday, September 6, 2016! We will have a booth with some exciting giveaways! While you are there, take a stroll around the vendor booths to check out all the local summer produce, seafood and artisan hot and prepared food. If you come wearing an MB10K t-shirt you can choose any 1 of the 3 giveaways! If you follow us on Facebook - Manhattan Beach 10K Run, Instagram - @mb10krun or Twitter - @mbeach10k you can choose a sticker or button! Tuesday 11:00 a.m. - 4 p.m.
Metered parking is available in the underground Metlox parking lot. We look forward to seeing you there! Make sure to stop by early before all the goodies are gone. For more details about the Manhattan Beach Farmers Market, visit their website here. Join the LA Kings and Daryl Evans at the Annual LA Kings 5K Run / Walk benefiting the Hydrocephalus Association on Saturday, September 17! We believe this is a great training race to prep yourself for the #mb10k and an awesome charity event. It takes place in Redondo Beach, starting in the Riviera Village near Village Runner. Bring the family and stop by the booths after the race for all kinds of fun activities. They will have hockey games, raffles, Bailey (the LA Kings mascot) will be there, members of the Ice Crew and some LA Kings players will be there as well! Are you up on all the happenings going on in the thriving city of Manhattan Beach? If you’d like to be more in the know, visit Dig MB here. This website is dedicated to keeping the community informed about all things from beach volleyball to education to where to get some grub and all things in between. Jeanne Fratello, editor, saw that there was a need for a daily news source for all the events going on in Manhattan Beach and wanted to create a real booster for the city and share the great and positive things that happen here. A lot of ideas were passed around but they decided to go with Dig MB because they really dig and love this place. What’s not to love?! It’s also evocative of digs made in volleyball and the simple act of digging in the sand. Besides updating their website constantly, Jeanne aims to send out a daily email newsletter featuring an event or issue. She also manages their very active Facebook account as well as Instagram and Twitter. Make sure to follow them so you can stay in the know! You can reach out to her through email or social channels to alert her about an upcoming event. Dig MB is here for you and is a resource for the community of Manhattan Beach. Jackie’s website is another gem to read about happenings not only in Manhattan Beach, but all over the South Bay. Jackie’s site is bursting with information about where to dine, what events are taking place and even an internet radio show highlighting those making a difference in our community. We love her So Bae section which features links for tweens, teens & young adults! We would love if you could spread the word about the Manhattan Beach 10K Run! All proceeds go directly back to our community so the more exposure we get the more $$$ for our terrific town! You can send a tweet, a shoutout on Instagram or Facebook, a newsletter or whatever creative way you come up with! Tag us on social so we can repost and use #mb10k. Thank you for you help and participation in our event! Did you know that the proceeds from the Manhattan Beach 10K Run go right into the community? Did you know that we award scholarships to Mira Costa High School Seniors? Thousands of dollars have been given to these deserving kids to help defray the ever-rising cost of college. Thank you for your participation in this run and assisting the students! Nick Zobel captained the Mira Costa Cross Country team his junior and senior year. He has run the race several times, quickly taking off for the starting line after belting out the National Anthem with the Mira Costa Choir. He used the scholarship money that he received in 2011 to buy textbooks for his freshman year at U.S.C. Even though Nick now lives in Sacramento, working as an analytics specialist for the Sacramento Kings, he makes time to come back for the 10K. He says it’s a fun run that gets you out of bed early and has a beautiful course. It’s the perfect excuse for him to come home, get some exercise and reunite with friends at the Hometown Fair afterwards. The College and Career Center (CCC) at Mira Costa offers a Scholarship Notebook Program where they help seniors build submissions for scholarships based on their achievements and efforts over the course of their high school career. The school posts all available scholarships and provides seniors with assistance in applying for them. A representative from the MB10K presents the scholarships at Senior Recognition Night in June. Minimum 3 Years of running in the 10K or volunteering to help with the event. Application completed and submitted to the CCC by the stated deadline. Along with this application please include a copy of your transcripts, and letters of recommendation from teachers, coaches, community members or employers. All applicants must include at least 1 letter of recommendation from a teacher/coach/community member or employer. Applications must be turned in by applicant by deadline to the CCC. No exceptions. Do not pass through directly to MB10K, coach or other. Any applicant who does so will be disqualified from consideration. We have a fresh, new look for the 39th running of the Manhattan Beach 10K Run! We have revamped our website and hope you agree that it looks pretty snazzy! If you haven’t had a chance to check it out, please do so here. First things first - please note that the race will take place on Saturday, October 1st, 2016 with a start time of 7:30 a.m. sharp. Registration for the race will be coming soon, so keep an eye out for it. In the meantime, gather all your family and friends and encourage them to come out and run with you or cheer you on along the beautiful course! Let’s get social! Please follow us on Instagram, Facebook and Twitter for all the latest news, updates, training tips, sponsors, volunteer opportunities and information about our awesome race and our beautiful hometown. Anytime you post about the race go ahead and use #mb10k, you never know, we may feature your post on our social pages. We can’t wait to see what you are up to with your race day training!